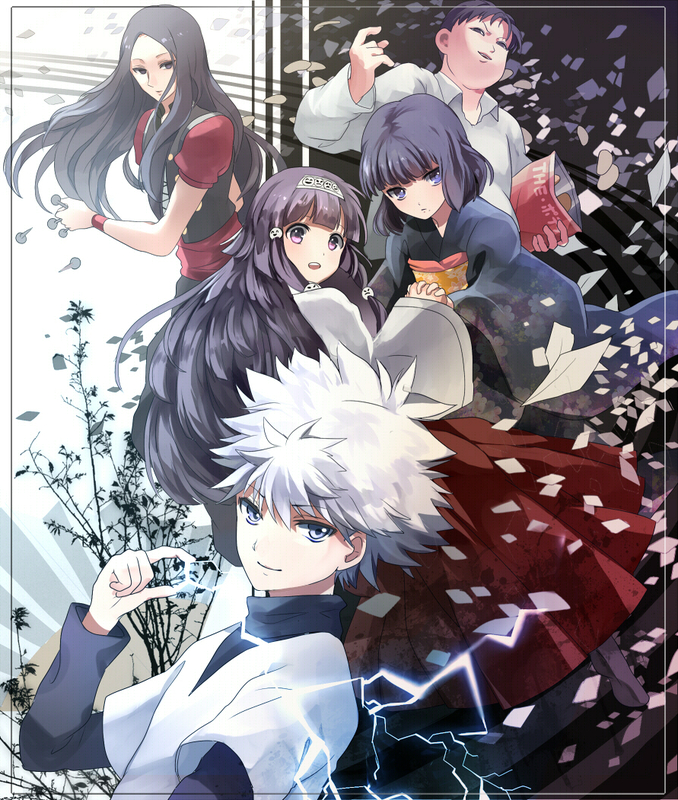 Killua Zoldyck (キルア=ゾルディック, Kirua Zorudikku) is a member of the Zoldyck family, who are a family of legendary assassins. Since birth, he trained endlessly in the art of assassination. He eventually ran away from his family and profession out of boredom and joined the Hunter exam to pass the time. 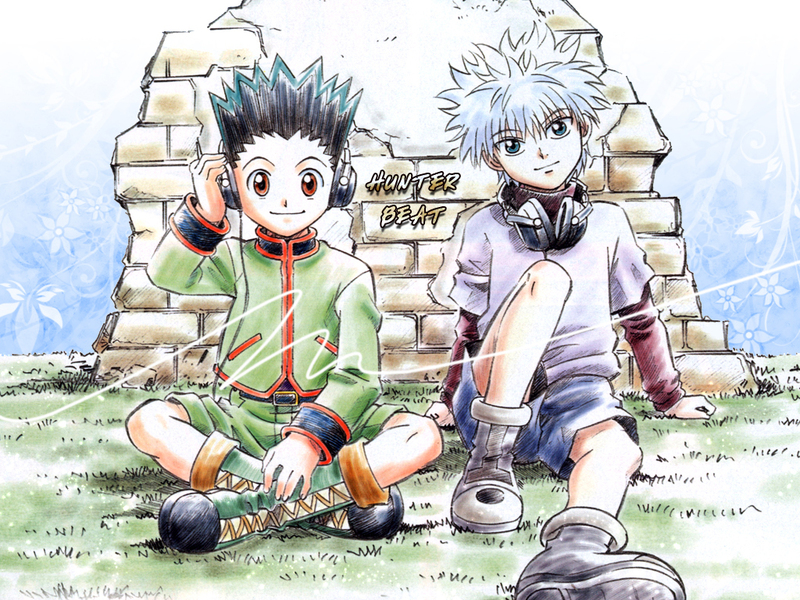 He befriended Gon almost immediately and has loyally followed his best friend since then. Killua is usually a kind-hearted and cheerful, cheeky boy, but if provoked, he becomes extremely deadly and bloodthirsty, able to kill an enemy in seconds. He is confident and aware of his abilities and strengths, and not afraid to speak his mind, but also smart enough to know when to hold his tongue. He can get embarrassed easily when someone compliments him or openly shows affection towards him. He is very intelligent and quick-thinking, and skilled in analysis, particularly induction. He is able to calmly and rapidly form strategies to adapt to stressful situations. 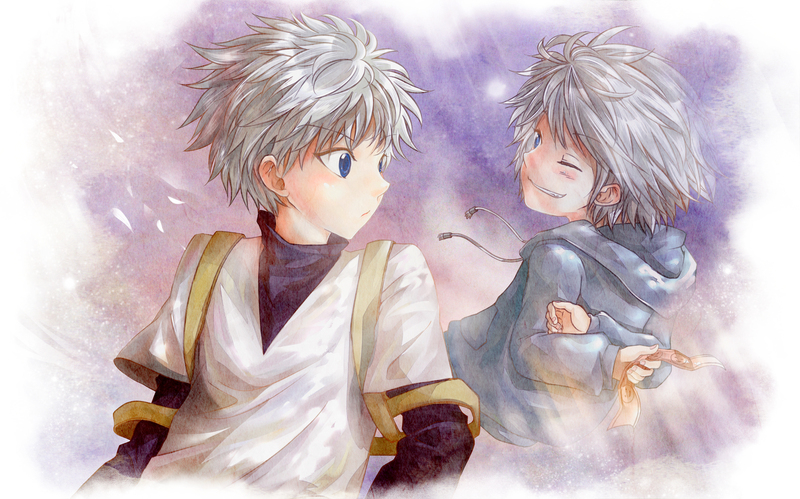 Conflicting with Killua’s predisposition to kill is his unyielding loyalty to his friends and natural kindness. Often, Killua suffers immensely in attempts to help his friends without a single complaint. Killua puts others before himself without being concerned about his own health or even his life. Previously, Killua’s greatest flaw was his fear of those seemingly more powerful than him (one of whom being his elder brother, Illumi). 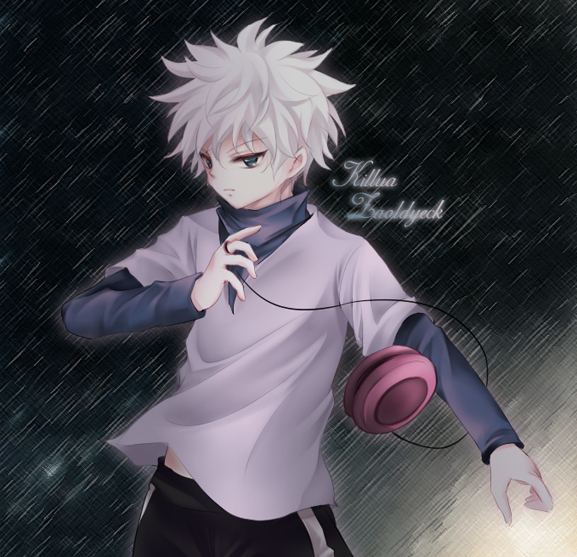 Killua had been trained as an assassin by his brother to be extremely cautious that he only engages in combat provided that victory is absolutely certain. This impeded him as a Hunter, as Biscuit stated more than once that victory is never certain, and that depending on the circumstances, a person has the potential to defeat a stronger opponent. Due to his training as an assassin, it’s an ingrained habit of his to be extremely cautious when approaching a fight, often assuming the worst case scenario, so he is quicker to flee than to try to face an apparently stronger opponent. For most of the series, this is his greatest flaw. He is also a loyal friend who is selfless to a fault, and suffers greatly trying to help his friends without a single thought to his own health. He is also from the transmutation Nen group. He constantly strives to improve his Nen ability, developing many interesting techniques as time moves on. He is also the third person to have a transmutation Nen as his father and grandfather also are transmutation Nen users. Coincidentally, all three family members have silver hair. 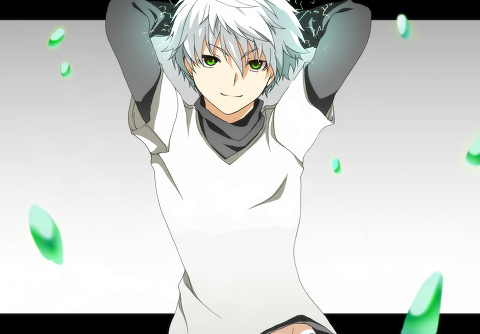 Killua has spiky silver hair, very pale skin and blue eyes. His eyes change shape depending on the mood that he’s in, narrowing and sharpening when he goes into assassin mode. Killua is fairly lean at the start of the series, due to constant physical conditioning and torture training he received when he was young. As time passes, he becomes more muscular and toned. In the Nippon Animation anime adaptation, Killua’s eye color is changed to green during the OVAs. He is also often seen holding a green skateboard (turned yellow in the 2011 series). 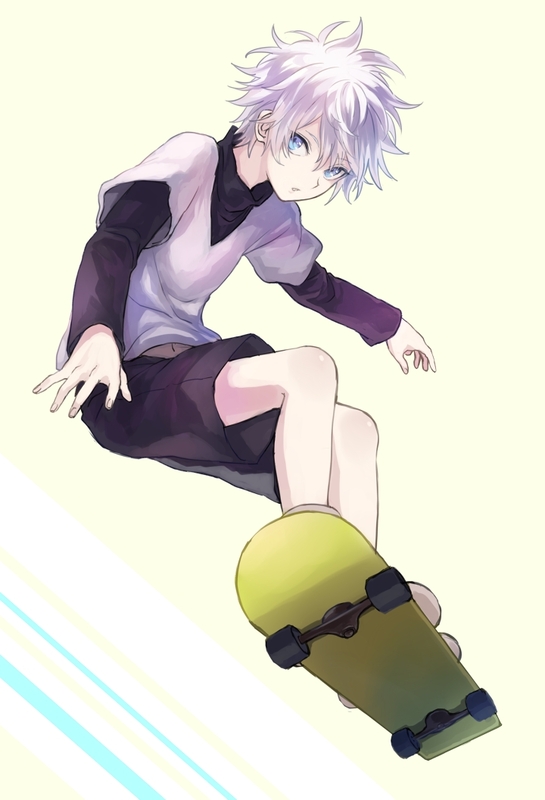 Killua typically wears baggy clothing, with his usual attire consisting of long-sleeved and dark-colored shirts. Most of his clothes have a turtleneck. 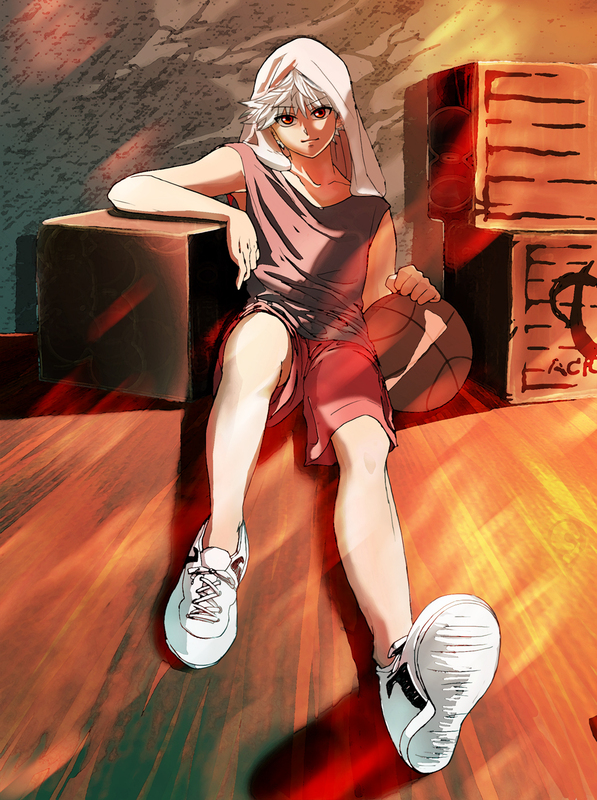 Killua wears long, baggy shorts in the manga and Madhouse animated adaptation, but Nippon Animation’s character design shortened them to reach above his knees. 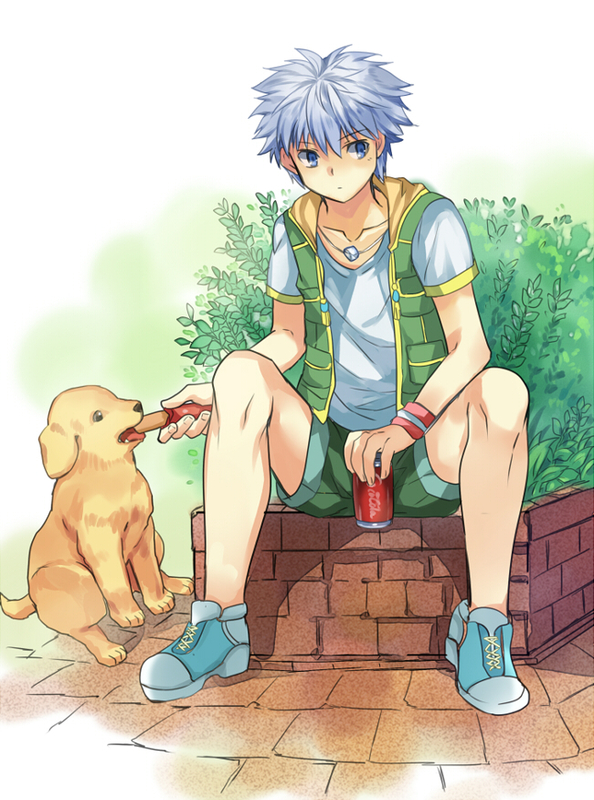 Killua also wears blue boots, recolored brown and black in the Nippon Animation adaptation. 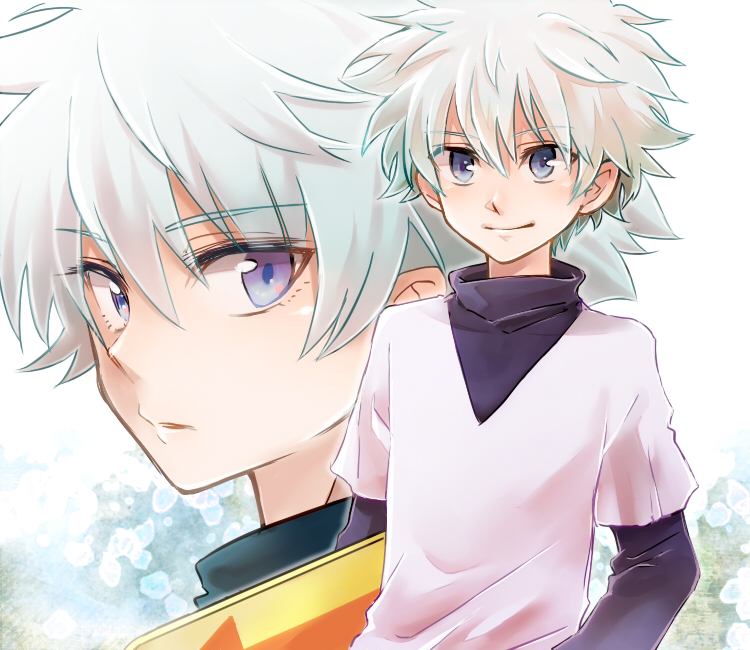 As a child, Killua’s hair is longer, almost cascading to his shoulders. He wore a hoodie with his trademark blue coloring, grey pants, and shoes. 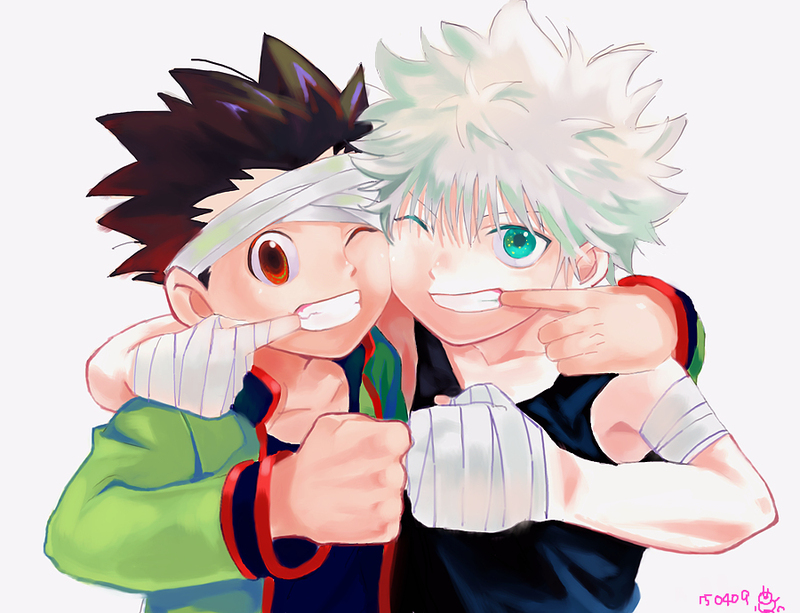 Initially, Killua is introduced as a character who appears similar to Gon, but different at the same time; cheeky, cheerful, and full of mischievous ideas. He is also one of the quickest-thinking characters in the series and often analyzes a situation with great ease and accuracy. In spite of his young age, his way of thinking, knowledge, and pragmatism give him the attitude of an adult. He is confident in his own abilities, often being humble about it; but when somebody compliments him, especially Gon, he becomes easily embarrassed. 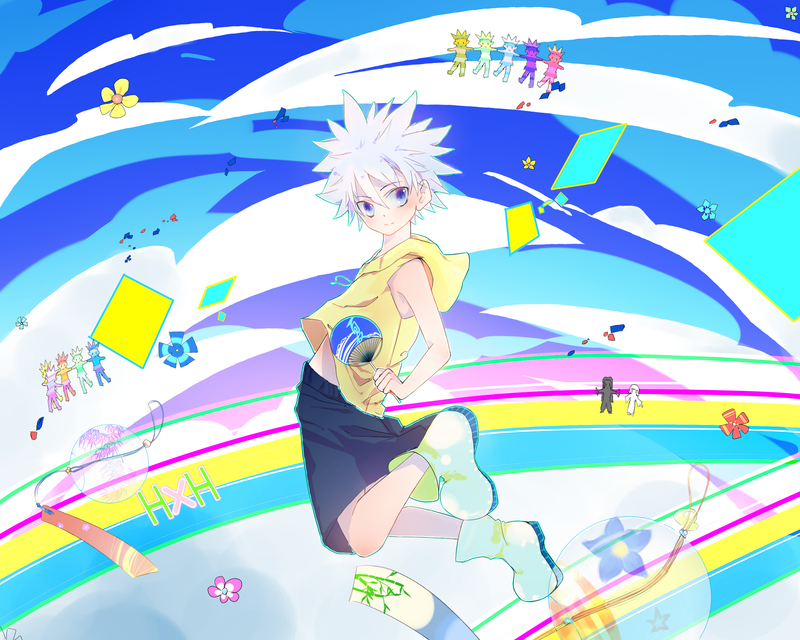 Killua is also known for having a sweet tooth; he loves everything sweet and spent almost 200 million Jenny on snacks when he was at the Heavens Arena. His favorite snack is chocolate, specifically Chocolate Balls. However, his ruthlessness and aptitude in killing shows the other side of him — deadly, violent, and bloodthirsty. Conflicting with Killua’s predisposal to kill is his unyielding loyalty to his friends and natural kindness. He claims Gon was his first friend, and he grows progressively more attached to him as time passes. Killua often suffers immensely in his attempts to help his friends without a single complaint. He puts others before himself without being concerned about his own health or even his life. Until recently, Killua’s greatest flaw was his fear of those seemingly more powerful than him (one of whom being his elder brother, Illumi). Killua had been trained as an assassin by his brother to be extremely cautious that he only engages in combat provided that victory is absolutely certain. This impeded him as a Hunter, as Biscuit stated more than once that victory is never certain, and that depending on the circumstances, a person has the potential to defeat a stronger opponent. 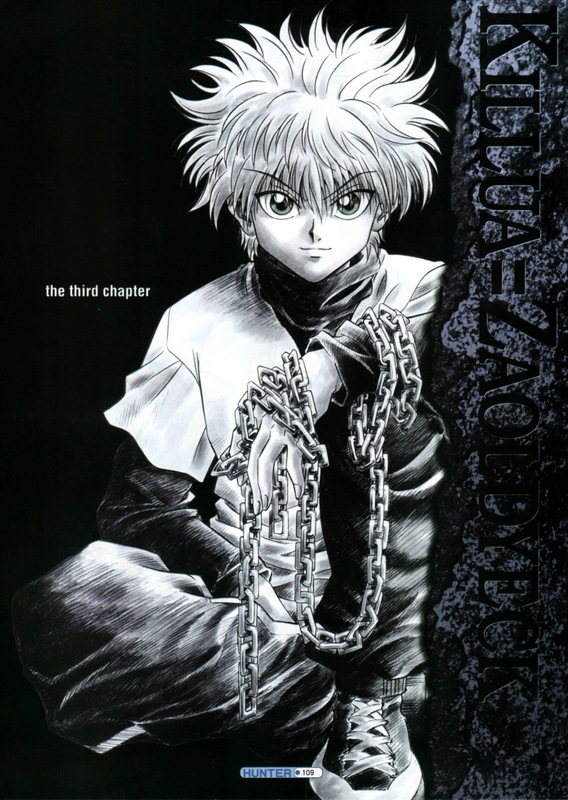 Killua especially struggles with these dueling ideologies during the latter half of the series, as he begins to encounter stronger opponents. His brother’s teachings remained firmly entrenched in his mind, to a point at which Biscuit prophesied that he would one day abandon Gon because of this. Biscuit gave Killua an ultimatum: Defeat Shoot to claim the right to go with Gon and fight the Chimera Ants or in case Killua lost, he resolved to leave after Gon had recovered from his fight, protecting him in the meantime. Finally he had to face Biscuit’s prophecy when he encountered a Chimera Ant while Gon (who could not use Nen at the time) was not far off and had no way to defend himself. Killua made an attempt to save Gon. 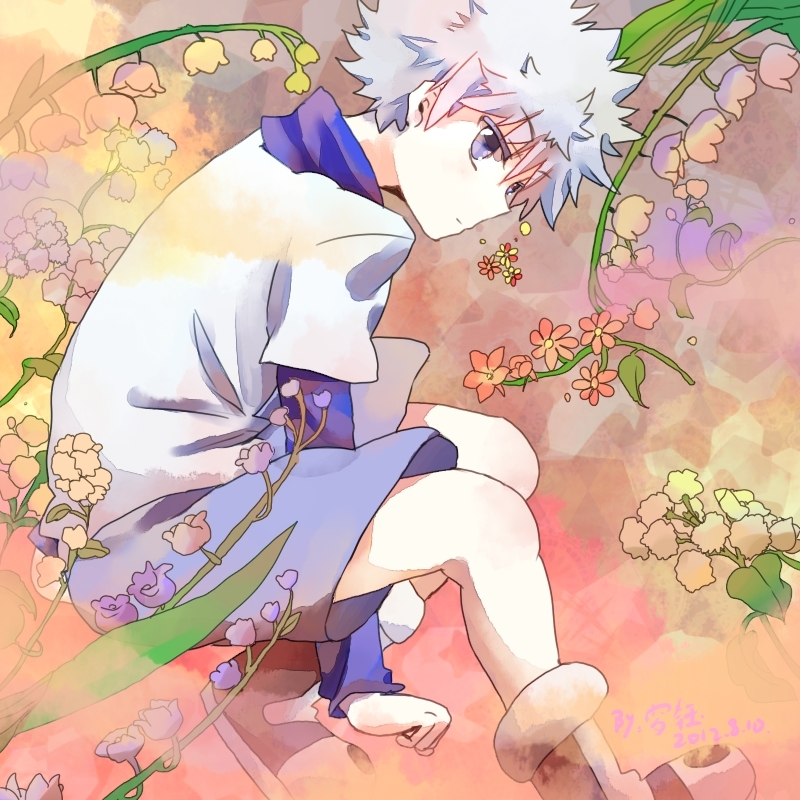 While fighting with the Chimera Ant, Killua was also battling his inner self. 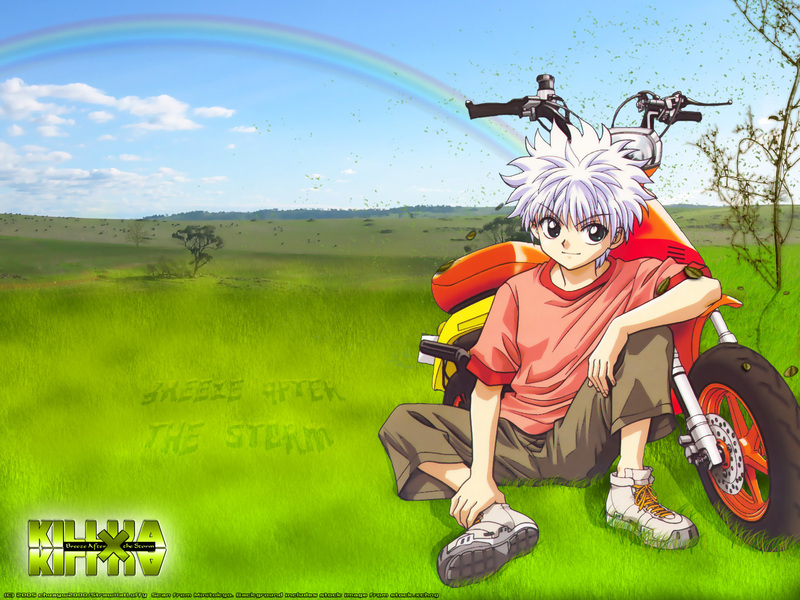 Preoccupied, Killua was losing to the Chimera Ant. At the last moment, Killua realized that Illumi had implanted a needle in his brain way back in the first Hunter Exam. This needle was responsible for forcing Killua to retreat and jailing himself in his comfort zone whenever any situation would potentially endanger his life. Upon extracting the needle, Killua was freed from this restraint and gained full control of his subconscious to make his own decision whether or not to flee whenever there is a need to fight stronger opponents. 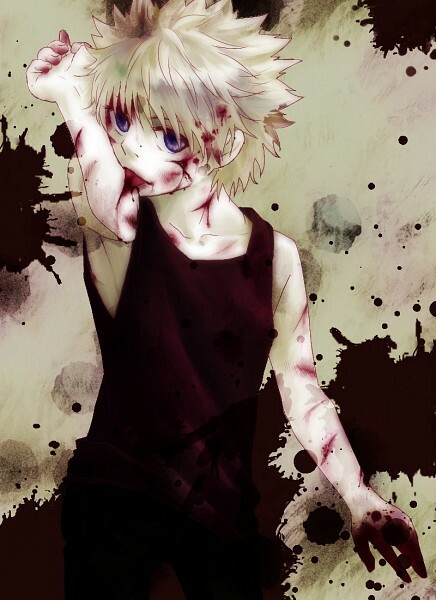 Killua was born as the middle child to a family of known assassins, the Zoldycks. Showing great promise from birth, Killua followed the traditional Zoldyck training. He had already mastered many killing techniques at a tender age, and was set to be one of the best assassins the family has ever produced. At the age of three, he started his training on tailing other people. He was forced to battle in theHeavens Arena martial arts tournament at the age of 6, in which he took two years to get to the 199th floor (even though he was accepted to the 200th floor, he bailed out). Killua divulges that ever since his birth, he has been in constant training for the occupation of a professional assassin. 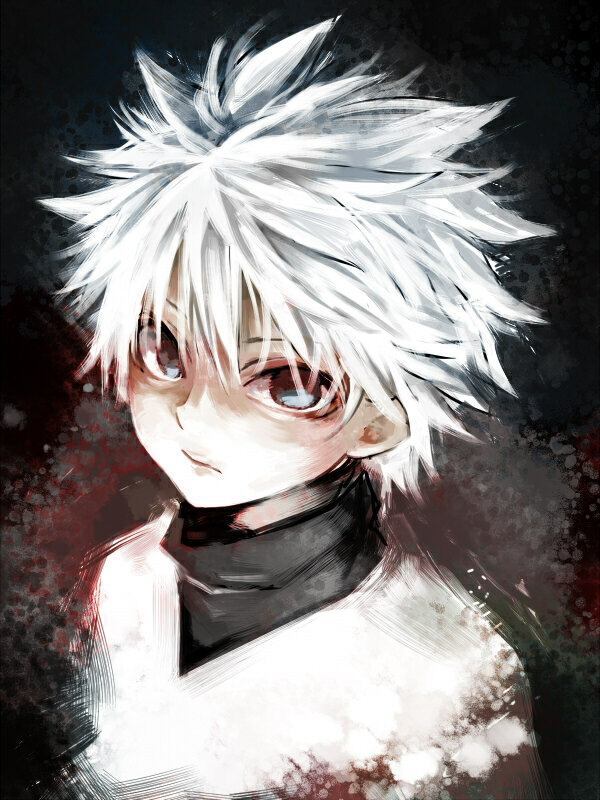 Killua had spent years trying to perfect unique skills that assassins portray and possess. Bored and tired of killing, Killua unexpectedly rebelled against his family, injuring both his mother and second brother, and ran away from home to take the Hunter Exam for fun. He meets Gon during the first portion of the Hunter Exam and they become the best of friends. He thinks being with Gon is exciting and adventurous. 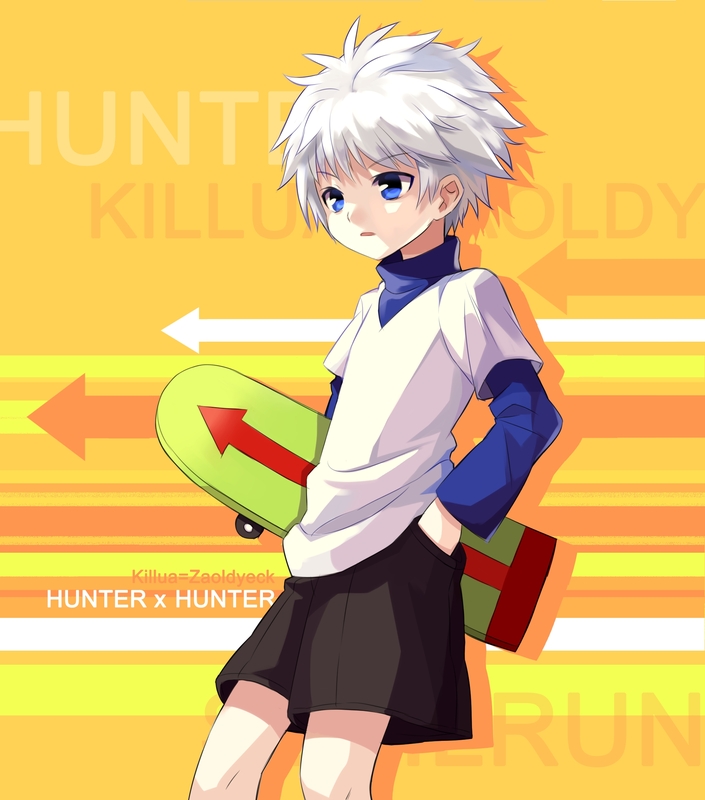 Skateboard: The first time he faced the Hunter Exam, Killua brought a skateboard with him. It was able to bear the weight of five people and a wooden shelf without breaking, although it was damaged in the process. The skateboard is yellow with red wheels and a red arrow painted in the middle, reaching almost to the curved end of the deck (dark blue-green with a yellow arrow in the 1999 anime). The skateboard is also briefly seen in the beginning of Hunter × Hunter: The Last Mission. Yo-Yos: After passing the Hunter Exam, Killua was given by Milluki two yo-yos made of a special metal alloy that he began using as a secret weapon. The yo-yos are extremely durable and heavy, each weighing 50 kilograms. Their reflective surface allows them to be used as mirrors to stealthily look behind a corner. 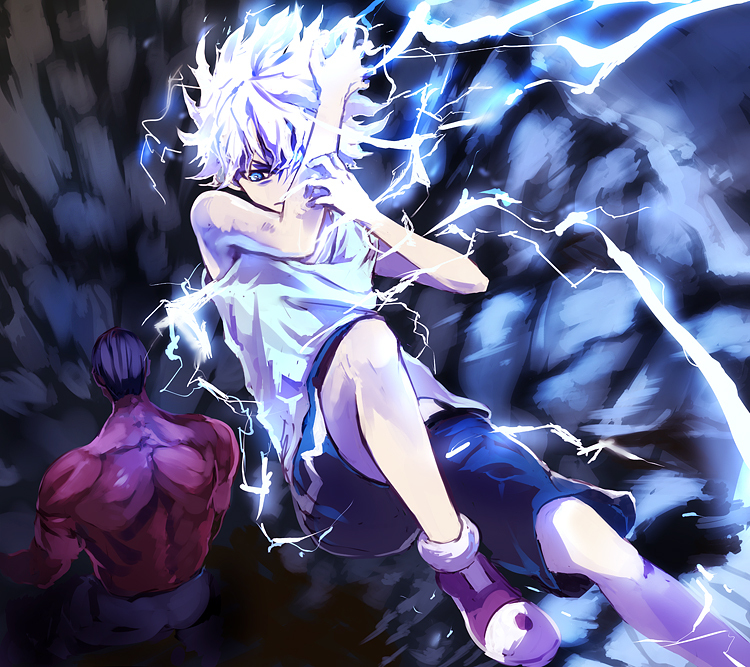 Biscuit claims they work well with Killua’s ability to turn his aura into electricity. 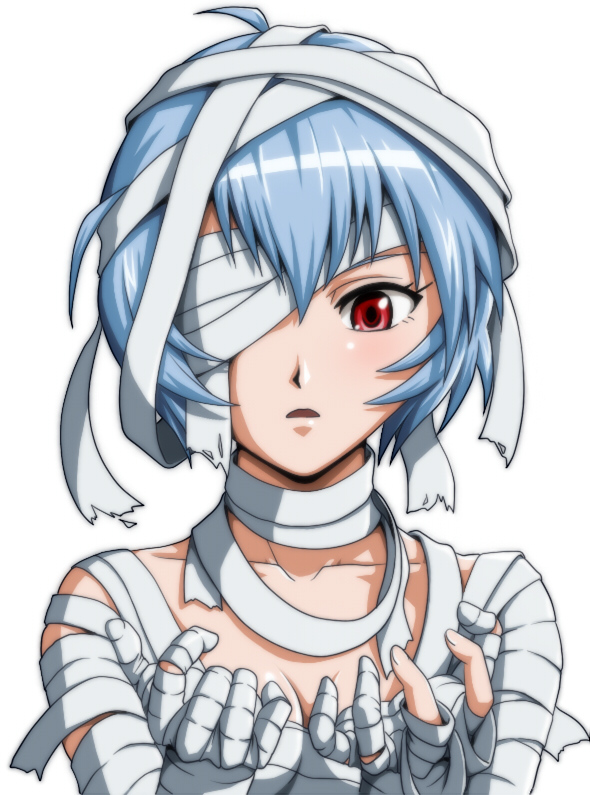 Rei Ayanami is a fictional character from the anime Neon Genesis Evangelion. She is the First Child (First Children in the Japanese version), pilot of the Evangelion Unit-00 and one of the female main character. At the beginning of the series, Rei is an enigmatic figure whose unusual behavior astonishes her peers. As the series progresses, she becomes more involved with the people around her, particularly her classmate and fellow Eva pilot Shinji Ikari. She is revealed to be a key factor in the events that conclude the storyline. Her role in this conclusion is not made entirely clear in the TV series, but is one of the principal plot points of The End of Evangelion. No specific information is given about Rei’s origin or heritage. Ritsuko Akagi states that Rei was born in a certain room deep in the lower levels of NERV headquarters, but this is all that is explicitly revealed in the series about her creation. The Red Cross Book stated that Rei was created from the “salvaged remains” of Yui Ikari after Yui’s absorption into Unit-01 in 2004. The connection between Rei and Yui is implied a few times during the series. Geno introduces Rei to the NERV staff in 2010 as an “acquaintance’s child” whom he is temporarily taking care of. In episode 21, Naoko Akagi says that Rei physically resembles Yui. The character model used in the 2010 scenes is based on development materials in which her age is only 4. Kaworu Nagisa cryptically mentions in their only conversation that she is “the same” as him. This statement was expanded in the “director’s cut” of the episode, in which Kaworu goes on to say that he and Rei are human vessels for the souls of Adam and Lilith, respectively. Later in the episode, she generates an external A.T. Field which is as strong as Kaworu’s. In a pseudo-hallucinatory scene in episode 25, “Gendo” tells “Rei” that the day of Third Impact is the day for which she was created. In The End of Evangelion, she plays an important role in Third Impact, although not in the fashion that was intended by Gendo. These different incarnations are commonly referred to as “Rei I,” “Rei II,” and “Rei III,” after episodes and musical pieces with the same names. In episode 23, the controller that Ritsuko uses to destroy the clones lists numbered clones from “Rei 004” and upwards. 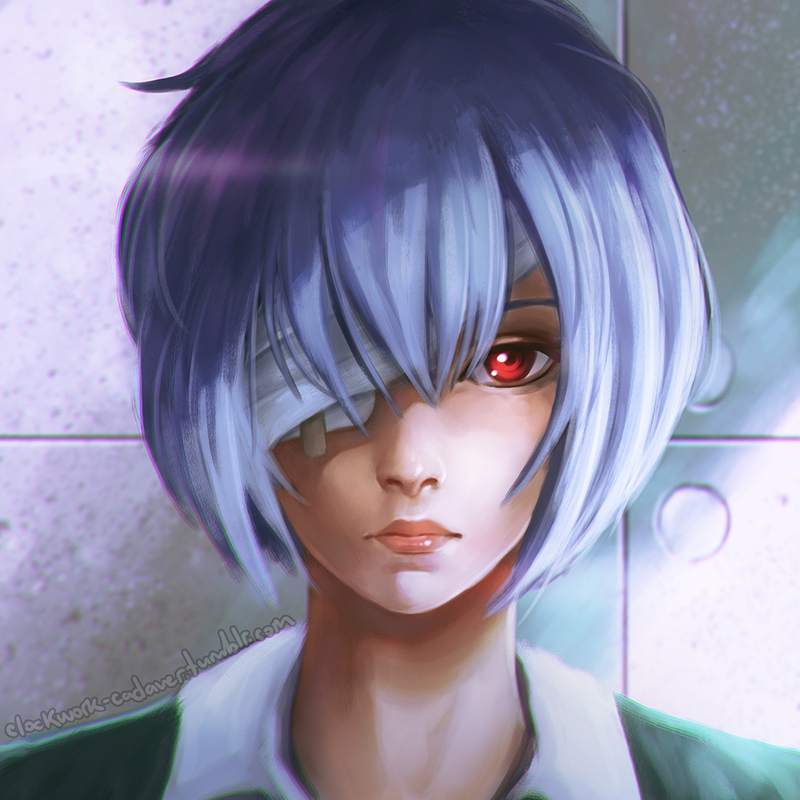 Rei I was the very first clone. She was murdered by Naoko Akagi in 2010 (as shown in Episode 21). 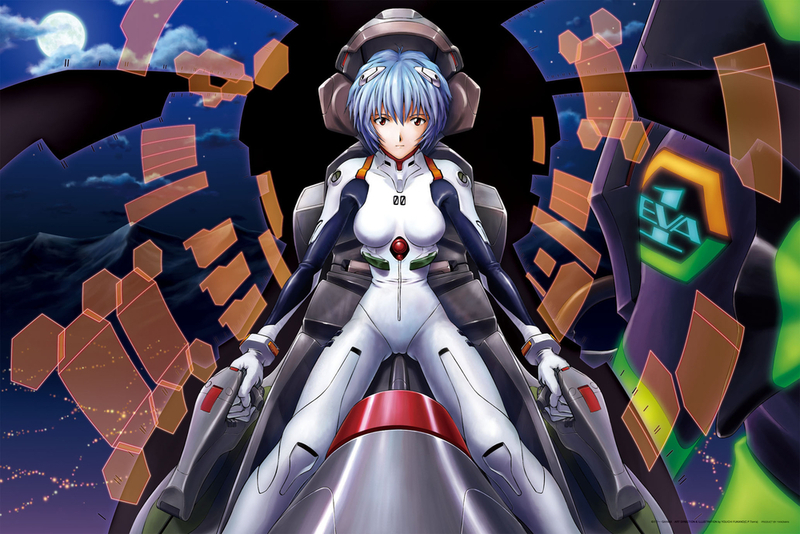 Rei II is the clone introduced in the first episode and who appears in most episodes of the series. She dies when she sacrifices herself and Unit-00 to destroy Armisael in episode 23.Rei III is the version seen from the second half of episode 23 through to The End of Evangelion. 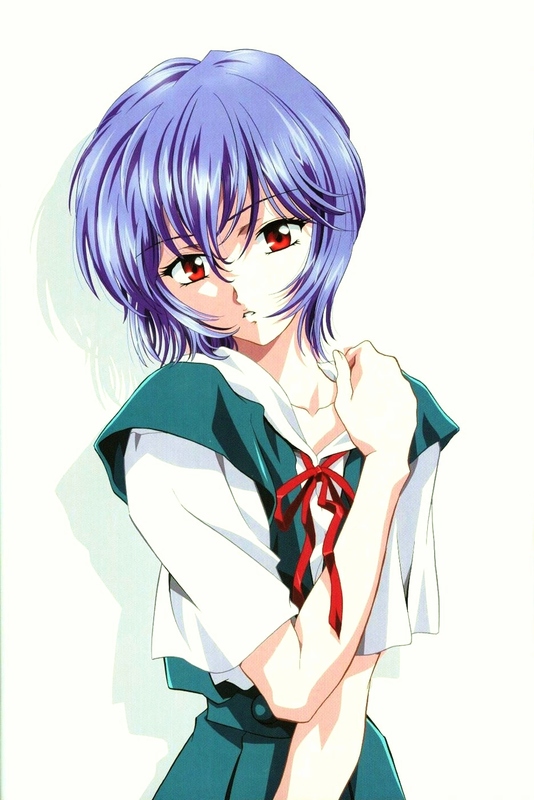 In the final episode of Neon Genesis Evangelion, the audience is introduced to a pseudo-hallucinatory alternate reality, with a different Rei. This Rei’s personality is completely different, and her behavior is more “normal” (for example, she shows embarrassment and anger when she thinks Shinji looked up her skirt, in stark contrast to her emotionless reaction to the incident with Shinji in Episode 05). 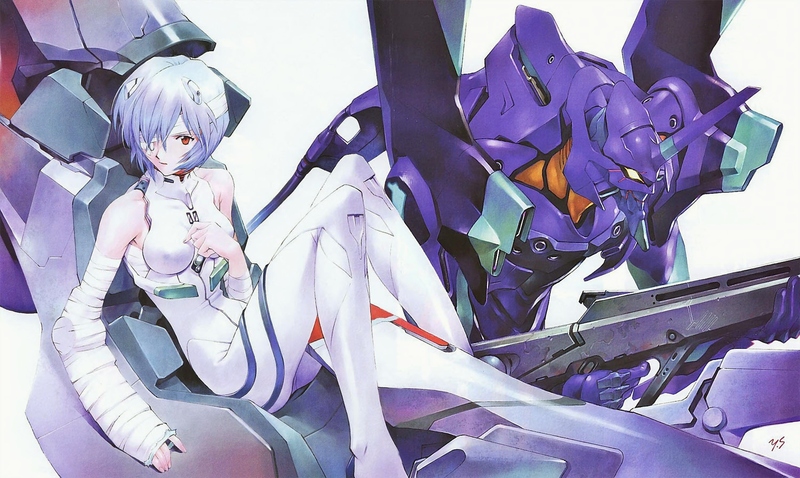 The Evangelion spin-off manga Neon Genesis Evangelion: Angelic Days is set in this alternate universe, and its version of Rei is a central character. In The End of Evangelion, a shining figure of Rei is shown for a few frames looking down at Misato and Ritsuko moments before they die. These spectral images also appear over the corpses of the slain NERV personnel. 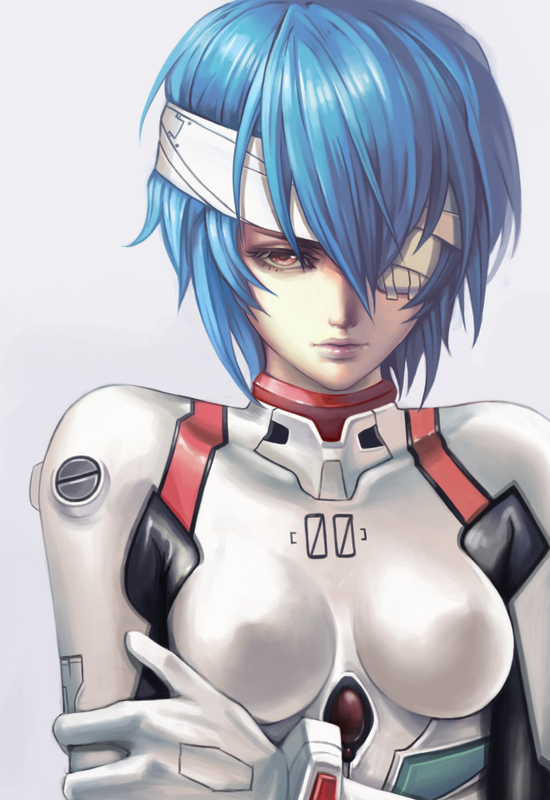 “Whatever else, she needs to be painted in as a bitterly unhappy young girl with little sense of presence.” Hideaki Anno, to Yoshiyuki Sadamoto on Rei’s character design. 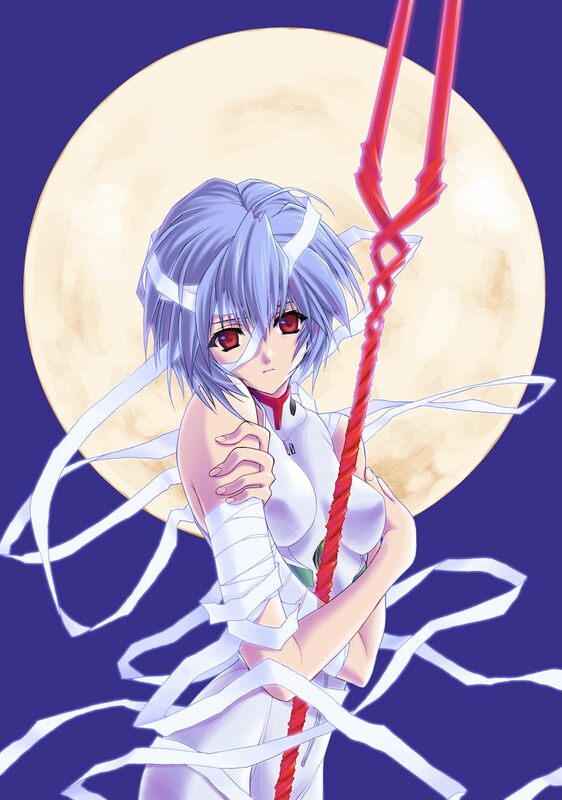 At the start of the series, Rei is socially withdrawn, seemingly emotionless, and rarely interacts with anyone, except for Gendo, to whom she initially displays loyalty but with whom she has a generally distant relationship. She lives by herself in a dull sparsely-furnished apartment in Tokyo-3. Toward the end of the series, Shinji comments that her apartment is very similar to the place where Ritsuko says Rei was born. “An emotional change causes certain muscles in the face to tense, producing an “expression”. Rei is expressionless but is it that she doesn’t feel emotion, or that she is merely unable to express it?” Yoshiyuki Sadamoto on Rei. Animax Carnival Philippines 2015 – is Set to Immerse the Filipino Fans in Japanese Culture! Animax, Asia’s first channel specializing in Japanese animation, will be bringing its annual flagship event back to the Philippines! Viewers and fans will be treated to two days of fun-filled anime-themed activities at Animax Carnival Philippines 2015, to be held at Hall 4 SMX Convention Center, Pasay City on 30 and 31 May 2015, 11am to 8pm. Anime lovers can look forward to a bigger event this year with more exciting activities such as special performances by renowned cosplayer Alodia Gosiengfiao, the Animax Cosplay Competition, exciting activities and sale of exclusive anime merchandise, and special guest performances from Japan. Admission to the carnival comes at the affordable price of Php 200.00 each. The Queen of Philippine Cosplay, Alodia Gosiengfiao will be performing onstage bringing some of her best costumes and pegs. Her passion for anime, video games and other creative media has led her to contribute to the rise of Cosplaying activities in Philippines so better watch out for her. Animax Carnival Philippines 2015 will see the return of the acclaimed Animax Cosplay Competition for cosplay lovers! Cosplayers can once again showcase their costume-making talents and emulation of their favorite anime characters with a range of realistic costumes and gravity-defying anime hairstyles to thrill visitors. This year, the competition will feature two categories, a solo category on 30 May, and a group (no more than 5) category on 31 May, both happening at 2pm to 5pm. Participants of both categories will stand a chance to win cash and exciting prizes and goodie bags, with attractive prizes worth over Php10, 000! Fans will get to be submerged into the world of anime and the Japanese culture through this year’s carnival. Attendees will be able to play traditional Japanese games and preview all of the anime posters and character artworks that have been featured on Animax. They can experience iconic Japan by learning how to write their names in Japanese and folding Origami for display. There will also be purchasable Japanese fashion pieces and Japanese food from a variety of designer booths and food stalls. Furthermore, fans will also be able to immerse themselves in products and gaming activities sponsored by Sony. Event goers will also get to have a chance to win various merchandise and premiums from Animax such as drawstring bags, sticky notes, folders, fans and much more. Animax Carnival Philippines 2015 will also be celebrating Japanese culture with the performances of special guests. We have performers from Japan namely “Triqstar” , who is known for mixing traditional Japanese Kabuki elements with new-age dance and Tambourine Master “Gonzo” will also be featured in the event. A Jpop dance routine will also be staged by the group, Junior New System. For more details on the carnival and the cosplay competition, visit the official Animax Carnival Philippines Website (www.animax-asia.com/acph2015); Like Animax Asia on Facebook: (www.facebook.com/animaxasiatv); Follow Animax Asia on Twitter (@animaxasiatv). Fans can also join in the conversation through the official hashtag #ACPH. Animax Carnival Philippines 2015 is jointly organized by Animax Asia in partnership Royal Tru Orange and Brothers. Animax is available in the Philippines on Skycable Channel 46 and Cignal Channel 34. Animax Carnival aims to engage and entertain everyone around anime and all things Japanese. Thanks to your support, it’s finally back here in the Philippines! What can I expect from Animax Carnival? There are a few zones, for everyone to be fully submerged in Animax and the Japanese culture. Carnival– where you can play fun traditional Japanese games and preview all of the anime posters and character artworks that have been on Animax! Yoyogi Park– where you can experience iconic Japan by learning how to write your name in Japanese and folding your own Origami underneath our very own Sakura Tree! Harajuku– where you can buy Japanese fashion pieces and taste Japanese food from a variety of food stalls and designer booths! Akihabara– where you can immerse yourself in products and gaming activities sponsored by Sony. When and where is Animax Carnival 2015 held at? Animax Carnival Philippines 2015 will be held at Hall 4 SMX Convention Center, Pasay City from 30 to 31 May 2015. The opening hours for both days will be from 11am to 8pm. With so many activities, how much is the entrance fee to Animax Carnival Philippines 2015? Animax Carnival Philippines is upping the ante this year! With a bigger space at SMX Convention Center Hall 4, we are able to accommodate more anime fans and transport them to a scenic interpretation of both old and new Japan. Event goers will also get to have a chance to win various merchandise and premiums from Animax such as drawstring bags , sticky notes, folders, fans and so much more. To be a part of such an amazing experience, the entrance fee is Php 200 per day. Where can we get our tickets for the Animax Carnival Philippines 2015? I did not manage to buy tickets for the Animax Carnival Philippines 2015 beforehand. Can I purchase them on-site? Yes, you can buy your tickets on site for both days of the event. But do arrive earlier so that you can experience all the activities at the Animax Carnival Philippines 2015! How do I get to Animax Carnival? Animax Carnival Philippines 2015 will be held at Hall 4 SMX Convention Center, Pasay City.